Whilst I was looking at the problems at Coventry Arena station, I came across this document entitled Coventry Rail Story – A Rail Investment Strategy for Coventry. The report starts like this. Coventry is the 13th largest City in the UK, with a population of 317,000. Following the loss of its primary manufacturing role in the 1970s, the City has significantly developed its service, health, technology and knowledge economy and 2 universities. However, Coventry has higher unemployment and lower economic output than the UK average. By 2021 Coventry’s population will grow by 15%, nearly 50,000 people, faster than any other part of the West Midlands, with 33,000 new jobs required by 2028. Its key strategy is growth via employment rather than housing, avoiding becoming an unsustainable dormitory city. It then goes on to describes the problems and opportunities in various areas. It is well researched document and should be read. It is interesting to compare the developments that have happened in Nottingham to what should happen in Coventry. Arriving by train in the two cities couldn’t be more different. Nottingham welcomes you with a rebuilt station with style and character and in minutes you can be on a tram to the city centre or other parts of the city. You can also get several local trains to suburbs and the surrounding area. Coventry welcomes you with a tired (the report’s word!) 1960s box station, where the onward connections to the city centre are either walking or a taxi. A sadist built the bus station on the opposite side of the city centre to the rail station. Hadn’t they heard of designing a proper Interchange? 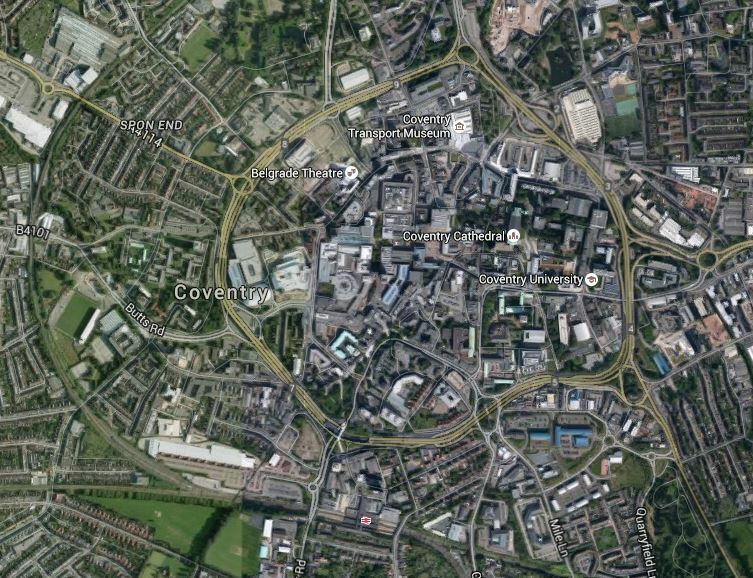 This Google Map shows the location of Coventry station with respect to the city centre and its surrounding ring-road. When you consider the new station at Birmingham, Coventry station doesn’t match up to the opposition and probably contributes negatively to visitors view of the city. How many jobs does the station cost Coventry? NUCKLE is a project to improve the rail services between Coventry and Nuneaton and Leamington. Phase 1 is described on this page of the Warwickshire County Council website. This is said. The Coventry to Nuneaton rail upgrade, known locally as NUCKLE Phase 1, will improve the existing rail line between Coventry and Nuneaton. It will deliver two new stations – one at Coventry (Ricoh) Arena and one at Bermuda Park in Warwickshire. It will also see the extensions of the existing platforms at Bedworth station and a new bay platform at Coventry station. The related phase 2 includes the new station at Kenilworth. As part of the Electric Spine, the Coventry to Leamington Line is going to be electrified and doubled. The Coventry Rail Story says that Coventry to Nuneaton Line will also be electrified. I suspect this will happen, as NUCKLE is in the West Midlands and they seem to get electrification done. So there will be approximately twenty miles of electrified line passing North-South through Coventry. So would this open up the possibility of an electric service from Oxford to Leicester via Kenilworth, using Aventra IPEMUs, which could bridge the gaps in the electrification between Leamington Spa and Oxford and Nuneaton to Leicester. This would fit the aspiration in the Coventry Rail Story of an improved train service between Coventry and Leicester via Nuneaton. Extending the Midland Metro to Coventry is being considered in the Line Two Eastside Extension. A tramway is planned between Coventry & Birmingham. Alongside the A45, using one of the two carriageways. The A45 is to be cut to single carriageway. Coventry station is a grade 2 listed building. After HS2 opens, the rail line between Coventry & Birmingham will close down!!!! I’m sure the tramway will be popular with motorists! Coventry starion must have been listed as a Grade 2 eyesore. I have a feeling Coventry won’t benefit from HS2. Kenilworth station is now open, but Coventry is poorly served by rail and could do with a station at Coundon being reopened. Due to the poor integration of public transport the city is being chocked by road vehicles and the roads are near grid lock at peak times. I feel Coventry, like many other towns and cities have followed Harold Wilson’s belief, that everybody will have their own cars, so there is no reason to invest any money in rail. One piece of good news for Coventry is that yesterday, Transport for London have taken delivery of the first Class 710 trains, which means eight two-car Class 172 trains, should be on their way to the Midlands in the near future.